davidraderii – Page 3 – THE NEW NHCA INC.
•	New Bay Bridge Crossing from Baltimore County to Kent County. He believes it will effect all Dundalk residents due to the proposed location. Went over minutes from months meeting. Delegate Bob Long stopped in. 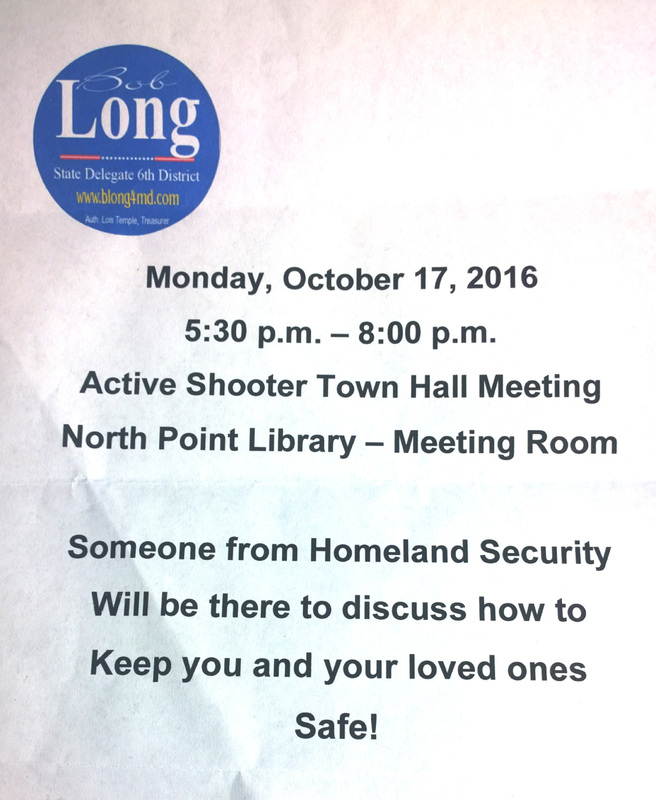 •	He will be having a meeting Monday, Oct. 17 2016 at the North Point Library – Someone from Homeland Security will be there. He gave us his office number. 7:01 PM meeting starts with the pledge of allegiance. There’s an ongoing murder investigation fifty fourth and Eastern Avenue. Eastfield road shots are fired. They are hiring cadets and officers of the police station. Lots of calls being made, one theft 6700 railway block. Two burglaries Snyder Avenue, and four Georges Court. One bomb threat at labor max. One juvenile arrest narcotics. One armed robbery drug related 7400 Holabird Avenue. Westfield road spray painted car and tires slashed. Two destruction of property on Alvah Avenue. Police Community Relations Councils hold meetings The second Monday of every month at 7 PM and they are open to the public. An amendment was made and passed about renters being allowed to become members, and able to hold officers positions and allowed to pay dues to our association. No one opposed. A member stated that he got 12 Flyers in six days. Wanted to know what could be done to prevent the waste of paper. Barry is supposed to meet with code enforcement people for trash day sweep. Dunlea apartments dumpsters are always overflowing and hazardous. Dawn suggested to call the high schools for clean up crew volunteers. Kids who need service learning hours. Our Community Yardsale will be postponed until the raindate of Oct. 8th. Some brave souls may still set up, so please feel free to swing through! Some of our advertisements are irretractable. Community Association meeting August 2nd 2016. Meeting started at 7:01 PM with the pledge. Operation sasquach is making his mark with code enforcement. We got our rat abatement. We need a new vice president now that Dave is president. Dons dumpsters through friend looking into dumpster day. William Galiazzo had to 4 way bypass we should send him a card We need the info for the hospital. We want to start a community walk group at 7 PM Thursday nights. Katie Bennett volunteered to be our new vice president. Yay! We need to get donations from local businesses and I need to talk to the Dundalk Eagle about our meetings being posted in the paper. We’re doing a fall community yardsale in October. Date to be determined. Start spring cleaning this summer! Buzzy Stockman, President, in attendance. David Rader, Vice President, in attendance. Dawn Rader, Treasurer, in attendance. Kelly Taylor, Secretary, in attendance. Barry Sayer, Community Safety Officer, absent. Officer Addair, Community Relations Officer, in attendance. encompassing Westfield and Ives and continues to Dundalk Avenue county line, on Railway Avenue odd side only over to Holabird meeting the county line. Largest community association in Baltimore County. Mr. William Galiazzo from Baltimore County Code Enforcement spoke about the rat problem in the neighborhood and is scheduling a rat eradication for the neighborhood that will occur probably sometime in late July or August. Mr. Galiazzo spoke about the fines, the costs, the violations. He provided his personal e-mail address to the association and attendees if anyone has any problems wgaliazzo@baltocountymd.gov. Mr. Galiazzo also took questions from the board and attendees. Community Relations Officer Addair gave report of the crimes encompassing the association’s boundaries and discussed ways to report crimes to the police. 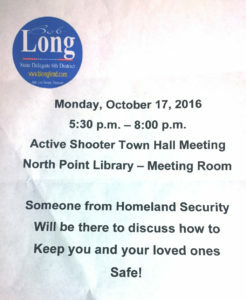 Meeting was adjourned at 8:00 p.m.
*ASKING FOR VOLUNTEERS TO FILL EMPTY SEATS. EMPTY SEATS ARE SECRETARY, AND COMMUNITY SAFETY OFFICER. POSSIBLE RAT ABATEMENT AT THE END OF MAY, HAVE TO LOOK INTO A DEFINITE DATE. PCRP COMMUNITY LEADERS MEETING IS THE 2ND MONDAY OF EVERY MONTH @ 7PM AT THE NEW PRECINCT UP UNTIL JUNE. THEY BREAK FROM JULY TO AUGUST. NARCOTICS # 410-887-7334 TO MAKE COMPLAINTS OR REPORT TRAFFIC. YOU CAN REMAIN ANONYMOUS. AND YOU CAN LEAVE A VOICEMAIL AND THEY WILL CALL YOU BACK. *BASEBALL CAMP- HOSTED BY OFFICER MIGELFISH, ON JULY 25-29 @ CCBC DUNDALK CAMPUS. SPONSORS INCLUDE CHICKFILA, GREEN TURTLE AND THE ORIOLES. * BASKETBALL CAMP- SOLLERS POINT MAY 21, 2016 9 AM- NOON NEED PERMISSION SLIPS FOR AGES 8-14. * THE BOULEVARD DINER IS HOSTING A FUNDRAISER FOR SPECIAL OLYMPICS ON JUNE 3, 2016 FROM 4-8 PM THE OFFICERS WILL SHADOW WAITRESSES. OUR NEXT MEETING WILL BE *JUNE 7, 2016 @ 428 WESTHAM WAY THE NEW BALTIMORE COUNTY POLICE PRECINCT. Community Association Meeting will be tonight, May 3rd, 2016 from 7pm-8pm at CCBC Dundalk in the Roy N Staten Building, room 102. We will have a membership drive, discuss upcoming and current community events and have voting for members. This is the newly designed website for The New NHCA Inc. Soon you will find many resourceful links and much information pertaining to our community. The links and information will include community events, FAQs, government and representative contact information and more. If you have any suggestions, please, drop a line.